Discussion in 'Sesame Street' started by Drtooth, May 19, 2010. Nice twist. uses the same song, but DOESN'T use a pinball machine... but uses the same whole aesthetic. Only thing I don't like is how it's been truncated musically. I can't watch it because of my browser obviously, but the idea of the Pinball Number Count being remade for today's audiences is bound to upset quite a few old-school fans. Nice, I didn't know there was a contest like that. Still you're right as there is no pinball machine involved, but the music is a nice reminder. I'm sure that some oldschoolers are gonna whine about the whole thing, while not appreciating the effort on the part of the animators (and I think this dude was brilliant)... but hey, it's not like the other 11 older segments have been locked up, never to see the light of day again. I'm sure they'll put it up on Youtube soon, though. Who said it had to? There are several different entries, and the ones I feel work best are the ones that DIDN'T copy the original in any form. While it didn't win, there's another really good one called "Planet 12" that uses the same music, but goes on a completely different tangent with a spaceman and aliens. There are some that DID copy the original, and I'm looking at them now. Not as much fun as the winner, though. Thanks for posting the winner. Many of these are excellent. I really liked “Rank 5: Pinball Number 12 Reanimated.” Very impressive in that it retains the elements of the original and yet has more subtle modern updates visually and audibly. Kudos to Sesame Workshop for bringing this classic to the forefront for a new generation. Ok, I give...after spending what seems like over an hour poking around that site, I can't find anywhere where all the entries for this contest, and them alone, are posted. I don't want to have to click through 400 vids...what am I missing? It is nice to see a modern animation take on the Pinball Number Count classic. But I think I'm still gonna prefer the original classic- but it's cool if a newer version introduces it to kids today. Though for the record, today's kids also enjoy the original animated classics, as my nephews can attest to. 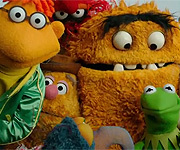 But in any case, it's cool to see Sesame Street bringing a classic to the forefront again- they've done this numerous times with other songs with live puppets- why not one of their animated classics? Well, the contest in general wasn't confined to pinball number videos; that was only one category of it. As per the rules, entries for all categories were posted into one common pool. WIth that said, if you do a search for "pinball" on that site, you'll find about thirty versions. Yeah... I can't remember all the different categories, but one of them was Pinball number Count. There are a lot of good ones, and a lot of ones that are just okay. There's one that has some pretty cute imagery, but the segment repeats the same footage over and over. Which is a shame, because I really liked how it looked overall. One doesn't even used the music for some reason, putting some lame generic tune (no lyrics either) over it, and it ruins the piece completely. But this Italian stop motion one - as Red would put it, the one that won- is my favorite of the bunch. It took the entire thing, managed to keep the aesthetic of the original, but did something entirely original with it. Heck, I like the look of it BETTER than the original. I never was a huge fan of the ball falling into that vortex on the second count of 12. It may not be the original animation, but at least they finally brought back the classic song! Usually I don't mind when they remake classic skits, such as Ernie's "Rubber Duckie" from 1998, or the new version of the "La-la-la" song that takes place in Ernie and Bert's apartment instead of behind the brick wall. As much as I hate to admit it, but I actually prefer how the newer Rubber Duckie segment looks over that drab blue background they had for the other one. I really like when they chose to remake older skits with the older audio and just freshen up the look. There's one there that's a TOTAL CGI remake of the first 30 seconds of it. I would have loved to see the whole thing in the style of that one. Some of the others are pretty... well... bland. I have to agree with your statement Phil. 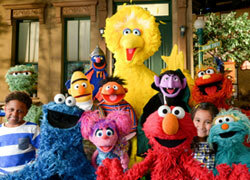 It's good that Sesame Workshop is able to give the new generation something they can enjoy as much as we did. It's very easy for us to forget that Sesame Workshop is doing its job and puts Sesame Street into the forefront of a younger audience than they used to in the beginning. Elmo may be used to help stimulate the audience, but Big Bird and the rest of the gang will live on just as much as him. That's my thought and I hope others can support that. I think the two linked are both GORGEOUS! Nice use of stop-motion animation styles. I love the use of the classic song and the colours are stunning! It's different. Miss the pinball machine; but, wasn't it great? Using only the music or only the animation from the original Pinball Count series (as most of the nominees did) doesn't do it justice. I'm surprised that this clip didn't rank higher than fifth place; if I'd been on the committee, it'd probably make number 1. A classic series deserves a remake that uses enough new elements for the target audience, but also enough old ones for viewers who grew up with the original. I actually didn't get to see that one until yesterday, and I think the cover of the music REALLY makes it pop. I still like the Italian animated one a tiny bit better... it has a certain Sesame Street quality to it. And it seems to be similar to the look of Bert and Ernie's Great Adventure. But the other one has a very smashing look to it, and the cover is quite catchy. There are some very good ones, but there's ones that I feel miss the mark somehow. There's one that was just pretty meh, and I didn't watch it the whole way through.